Yesterday I completely blew off my morning workout. I would say it was in light of wanting to catch up with the news of Bin Laden’s capture and death (I’m in bed by 10pm, guaranteed), but I hadn’t even put my feet on the floor before I had decided a morning workout was just not in the cards. I made up my workout before class, though. Crunch Diesel. Or as I like to call it, 23 minutes of bust your hump hell (the last 5 minutes I was verbalizing profanities). Have I mentioned lately that I hate resistance training? I’m going to Chicago again this weekend and my mom has plans for us to attend step at 8am and the strength and conditioning class at 9am this Saturday. I (not so happily) agreed. Mama Prevention (though very youthful and fit!) should not be running circles around her 25-year-old offspring. As I ration out my Kinder, and pry it from the hands of my junk food-loving husband, I’m glad I have a lower calorie treat to substitute. I would say I would “settle” for these Cheesecake Stuffed Strawberries, but that would be an injustice to them….they’re delicious. And I think everyone was made aware by Whole Food’s strawberry sale last week…berries are slowly coming into season 🙂 And cream cheese? Well, I’m under the impression it’s always in season. Har har. In a medium bowl, beat the softened cream cheese, vanilla and sugar in a bowl until fluffy. Place the filling in a pastry bag fitted with a star tip. Set aside. 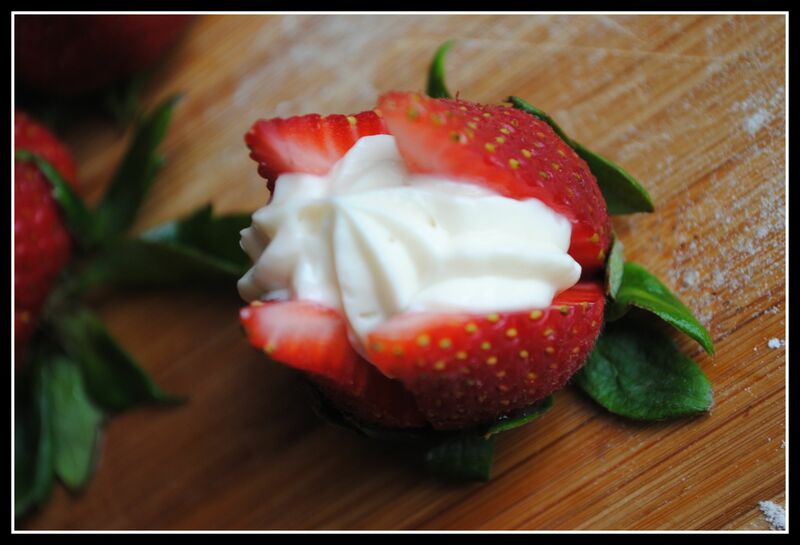 Take the strawberries and with a paring knife, cut an X from the tip of the strawberry almost all the way through. Gently push the tip of the pastry bag in the middle, and pipe in the filling. Chill until serving. Yield: ~ 28 strawberries. I (finally) got around to returning lots of reader emails yesterday. I apologize for my response time and sincerely appreciate all of your notes and questions! Thank you! Question: What fruit/vegetable are you anxiously awaiting to come in season this spring/summer? You had me at the word “Cheesecake.” I’ll definitely be making this recipe soon. 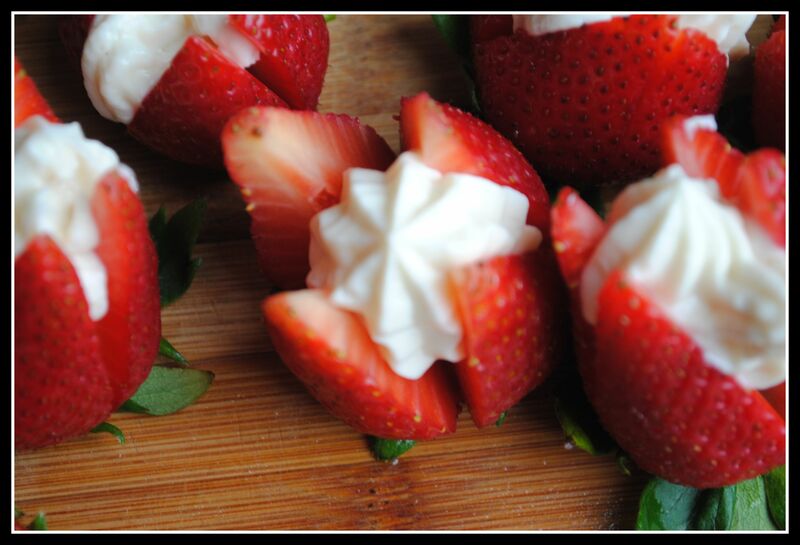 I love cheesecake and strawberries are one of my favorite berries! I hope you enjoy them! 🙂 They’d go perfectly with one of those Nutella cookies! My mom made salads with baby lettuce and spinach from her garden when I was home. 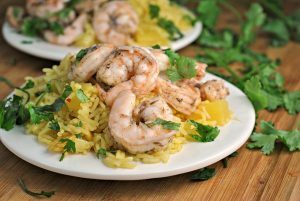 If I had my way, I’d eat it every day all summer long… soooo good. What a delicious idea! I love real strawberry cheesecake, but for times when I don’t have access to any, these would be the perfect fix & healthier too! 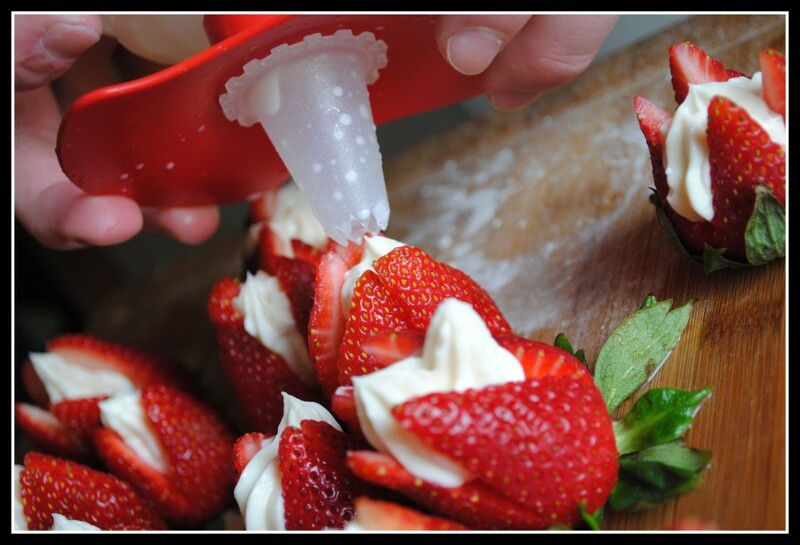 Your cheesecake stuffed strawberries look fanastic…gorgeous enough to be bakery material, Nicole! Mmmm, I can’t wait for fresh cherries!! I used to force myself to workout whenever I planned to workout, no matter how I felt, but now I feel confident that even if I don’t workout when I plan it, I will eventually do it! It’s a great feeling to be more liberal with my workout schedule. Your strawberries sound wonderful. I need to get one of those tools to squeeze icing/cheesecake/etc. into things this summer, I bet that would come in handy! I am looking forward to all berries, and tomatoes this summer. Good luck with the exercise class in Chicago. The last time my mom and I did an exercise class together we laughed the whole time. Yeah, that happens when we get together and realize we aren’t as strong as we thought. I don’t think the other people were too happy with us! I agree…so long as it gets done! I love simple treats like this one! Two of my favorite things mentioned in this post. Kinder chocolate and strawberries. Well, actually four. Cheesecake and Whole Foods sales are totally awesome too. $1.99 for a pound of organic strawberries…I was totally sold!! And this is such a cute idea…I’d love to set this out for a party/dinner party/etc. These look so tasty (and pretty!!). No real recipe. Pineapple + dark rum + brown sugar, then grill. Will add it in my next blog post. Just need to get some pics first. I cannot wait to get my hands on juicy watermelon. It’s one of my summer favorites. 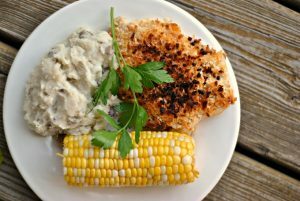 Corn too, so good. I stayed up late to watch the President and skipped my morning workout too. I did get in a really nice 3 mi run after work. I love that it is light out so late now! I love these little stuffed strawberries! They would be great for a party. I can’t wait for tomatoes to be in season. Our seedlings have been started and are almost ready to go in the garden. There’s nothing like a ripe (Jersey) tomato still warm from the sun! Hi Nicole! This is such a great idea!!! Where are you planning on working out in Chicago? The strawberries look fantastic! I can’t wait for tomatoes to be in season. There’s nothing like a fresh tomato. It screams summer to me! oh my!! Those are so fancy and look delicious!! Love ’em! This is a great idea! I have to keep these in mind for my next party!! What a sweet treat! I cannot wait for blueberries to come back into season. Seriously???? Just when I think you can not outdo yourself…YOU DO!!!! I could eat a whole plate full of these strawberries. RIGHT NOW!! I can’t wait for fresh blueberries and just picked tomatos. drool. Have a great day Nicole!!! Those are so beautiful, Nicole! They would be nice to make for a party! Oh my goodness – these sound so delicious, and theyre adorable. I cant wait for watermelon. I LOVE watermelon. 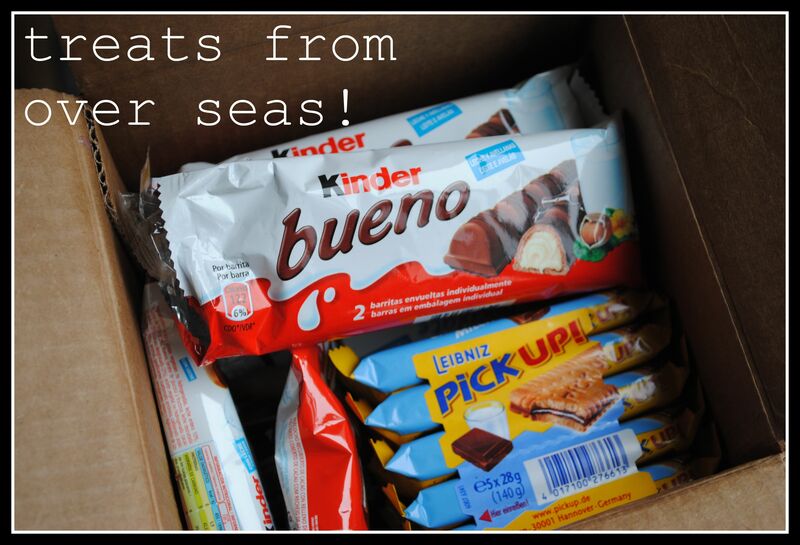 Hi Nicole– my husband is in love with Kinder! Do you know that you can get it around here too? Try an independent European grocery store! Huh! Go figure! Thanks for the heads up! I’ll keep an eye out! I can’t even look at those. They look SO GOOD!! So glad everything made it there in one piece. Enjoy! Since we are moving this summer, there is nothing I am really looking forward to coming into season, but I am looking forward to learning about produce in Japan. I can’t wait to hear about EVERYTHING in Japan! Oh wow, these sounds wonderful! What a simple and relatively healthy treat! I want to make these for a party my family is having in June! I definitely can’t wait for blueberries!